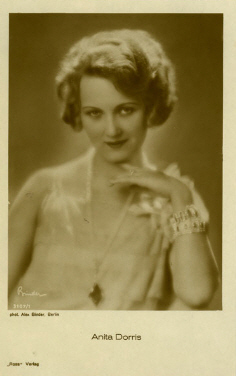 The actress Anita Dorris was born as Anita Dorothea Schmidt in Lübeck. Because of her acquaintance with Anton Kohl she got her first engagement at the Stadttheater Eger. Although she never got acting lessons she was able to extand her abilities in the next years and got rapidly more positive criticisms. Her career in the film business came more by accident into being. She acted for a friendly cameraman in front of his camera because he applied for a job by Friedrich Zelnik with a sample of his skill. But Zelnik didn't pay attention to the sample of the cameraman but was enthusiastic about the acting Anita Schmidt. Eventually he engaged her for his movie "Die Mühle von Sanssouci" (26), Anita Schmidt changed her name and was called Anita Dorris from now on. The successful debut led to other film offers like "Im weissen Rössl" (26), "Als ich wiederkam" (26), "Svengali" (27), where she performed her most impressive performance as well as "Bigamie" (27), "Königin Luise" (27) and "Sturm auf drei Herzen" (29). The sound film wasn't a problem for the stage experienced voice of Anita Dorris. Sie continued her career seamless with the movies "Gigolo" (30), "Mach' mir die Welt zum Paradies" (30), "Nur Du" (30) and "Student sein, wenn die Veilchen blühen" (30). Her promising career ended abrupt when she got married with director E.W. Emo (1898-1975) and retired from filmbusiness at his request.